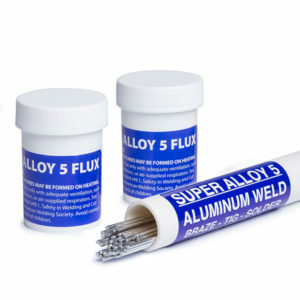 Super Alloy 5 aluminum brazing rod and an oxyacetylene torch with size 1 brazing tip are used to repair a large dent in an aluminum boat. For this application, a carburizing flame is recommended, to avoid overheating the thin aluminum parent metal. The technique highlighted in this video is an aluminum brazing application. Brazing has many advantages over welding: aluminum brazing equipment is inexpensive and portable, no special skills are needed (simply follow the instructions shown in this and other MuggyWeld.com videos), aluminum boat repairs are made quickly and without disassembly, and the resulting bond is a permanent solution for many aluminum boat problems (cracks, tears, seams, rivets etc). 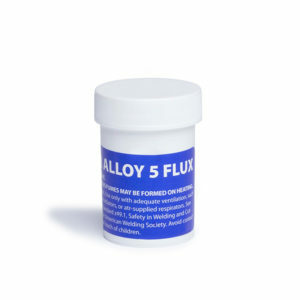 Super Alloy 5 is effective for building up and filling holes, dents, voids, pits, porosity, low spots and other damage to aluminum boats.